Blogilates-She runs a fantastic Food and Fitness blog that I follow every. single. day!! Rabbit Food for my Bunny Teeth-Another wonderful Health blog! Parajunkee's View: I've been following Parajunkee for as long as I can remember! Midnight Bloom Reads: Liz and I met over at The Chapter Community and I always loved hearing her point of view of books or anything book related. She balances school and blogging so well. That is definitely inspiring! I come across new blogs every day that I find inspiring. When you can balance kids, life, school, a job, hobbies, sports, etc with a book blog. That is VERY inspiring! written in the past that you feel deserves more love! These are two of my favourite books! Thanks for hopping by! Be sure to leave your link in the comments so I can hop back! 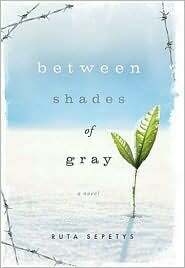 I read your review of "Between Shades of Gray" and thats what actually finally convinced me to pick up the book. I love Rachel's BB101 posts. I get really inspired from them, and they are helpful. I need to visit Liz's blog again. I miss Midnight Bloom Reads. New Follower. New GFC follower! And OMG revolution is my favourite book, i love everything about it! How it jumps nback and forth through times..Paris..everything! Will definitely be checking between shades of grey out! Parajunkee is such a great choice! New GFC Follower! Lovely blogs! I also love the TGIF Pimp your review, lol! I might partake in that :) Have a great day!